The American Eagle is the United States’s official gold bullion coin and first released in 1986. It has Lady Liberty on the obverse, with an eagle carrying an olive branch on the reverse. 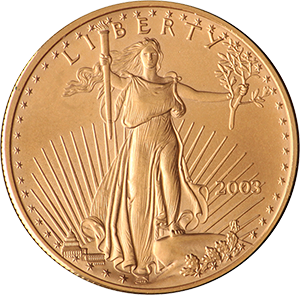 The Gold American Eagle is one of the most popular gold bullion coins in the world. First released in 1986, it quickly gained a share of the market alongside other the government minted bullion coins that had become so ubiquitous during this period. Due to the fact that an “Eagle” coin had already existed in the U.S. currency (the now obsolete ten-dollar coin) the bullion version is typically referred to with its specific denomination, such as the 1 oz American Eagle. There also exists a 1/10 oz. 1/4 oz and 1/2 oz version of the coin. The 1 oz American Eagle measures 32.70mm in diameter and has a thickness of 2.87mm. It has a gross weight of 33.930g and a face value of $50. Due to the coin’s purity, it is 24 carats (making it 99.9999% pure gold), the coin’s actual value is well above its this and will depend on the price of gold on the global market. As with any gold coin of this level of purity, the Gold American Eagle should be handled with great care as it presents some degree of malleability. 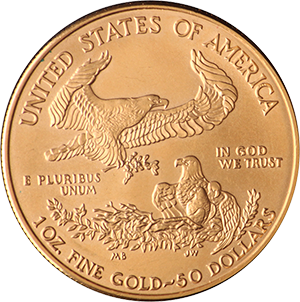 Production of the Gold American Eagle has fluctuated since its introduction in 1986 (when almost 1.5m of the 1 oz denomination alone were produced), but millions of all denominations are still produced yearly to this day. At its peak at the turn of the century, the United States Mint were manufacturing more than half a billion each year, with the 1 oz denomination the most ubiquitous. Some collector’s versions are also produced in small numbers each year as well, manufactured by the West Point Mint, New York. Due to their collectability, these versions are typically higher priced than the normal release. Although this will depend on the coin’s condition.